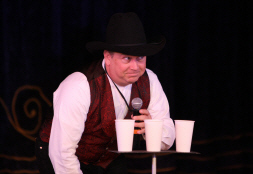 Close-Up magic is an excellenct choice for your next hospitality suite, and Doug is the perfect entertainer to chose. 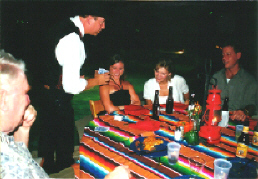 Intermingling with guests or seated at a corner table, Doug's amazing sleight-of-hand magic (which won awards at the Las Vegas Desert Seminar of Magic) creates a great memorable impression on your guests with his 'shoot-from-the-hip' style of interactive magic interspersed with his God-given quick wit. "It happened in my own hands!" and "I was watching his other hand and still couldn't catch how he did it!" are just a couple of exclamations overheard as Anderson entertains at point blank range. A common point of reference while laughing and having fun helps put everyone at ease. This allows you and your sales reps to spend more time with potential clients. After all, isn't that the reason behind spending thousands of dollars on food, liquor and staff? Having Doug entertain at the opposite side of the room can help avoid traffic flow problems at the doorway, around the food or bar. Doug intermingles with your guests, allowing him to find small pockets of non-participants & make them feel welcome. At closing time, he can do "one last big trick" near the doorway as a way of closing the evening. 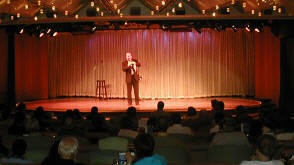 With a track record of over 30 years on 5-star cruise ships, at trade shows, hospitality suites, awards banquets and churches, you know that comedy magician Doug Anderson is doing it right. Right for them, right for you.